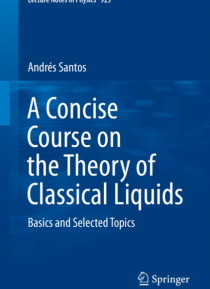 This short primer offers non-specialist readers a concise, yetcomprehensive introduction to the field of classical fluids - providing bothfundamental information and a number of selected topics to bridge the gapbetween the basics and ongoing research.�� In particular, hard-sphere systems represent a favorite playground instatistical mechanics, both in and out of equilibrium, as they represent thes… implest models of many-body systems of interacting particles, and at highertemperature and densities they have proven to be very useful as referencesystems for real fluids. Moreover, their usefulness in the realm of softcondensed matter has become increasingly recognized�-�for instance, theeffective interaction among (sterically stabilized) colloidal particles can betuned to almost perfectly match the hard-sphere model.These lecture notes present a brief, self-contained overview ofequilibrium statistical mechanics of classical fluids, with specialapplications to both the structural and thermodynamic properties of systemsmade of particles interacting via the hard-sphere potential or closely relatedmodel potentials. In particular it addresses the exact statistical-mechanicalproperties of one-dimensional systems, the issue of thermodynamic(in)consistency among different routes in the context of several approximatetheories, and the construction of analytical or semi-analytical approximationsfor the structural properties.Written pedagogically at the graduate level, with many figures, tables,photographs, and guided end-of-chapter exercises, this introductory textbenefits students and newcomers to the field alike.